When the signs of a and b are the same (either both positive or both negative), the graph shifts to the left. That is, the vertex of the parabola is to the left of the y-axis. When the signs of a and b are different (one is positive and the other is negative), the graph shifts to the right. In this case, the vertex of the parabola is to the right of the y-axis. A good mnemonic for remembering this rule is that the word same and the word left both have four letters. A quadratic function y = ax2 + bx + c crosses the x axis at x = 4 and x = –2. Which of the following must be true? 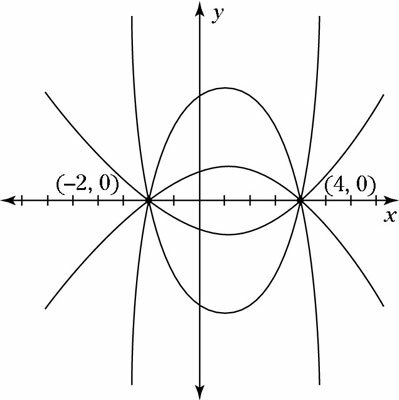 The only thing you know for sure is that the parabola’s vertex is horizontally in the middle of these two points, so it’s somewhere on the line x = 1. Thus, the parabola (whatever it looks like) is shifted to the right, so a and b have different signs. So a does not equal b, making the correct answer Choice (C).